Scientists from the University of Hyderabad and the Robert Koch Institute in Germany revealed in a study the presence of resistant bacteria in chicken sampled from retail wet market in Hyderabad. The study was published in the journal Applied and Environmental Microbiology by a team of researchers lead by Niyaz Ahmed. Intestinal samples from 55 broiler and 45 free range chickens from retail poultry outlets were collected. Eleven isolates of the bacteria Helicobacter pullorum were isolated from all samples and subjected to antibiotic sensitivity tests. The broiler chickens were reared in farms which used antibiotic-laden feed. All the samples were resistant to at least three antibiotic classes, irrespective of where they were from broilers or free-range chickens. The results show that all Helicobacter pullorum isolates showed 100 per cent resistance to antibiotics nalidixic acid, enrofloxacin, co-trimoxazole and cefotaxime, whereas more than 80 per cent resistance was detected against ciprofloxacin. 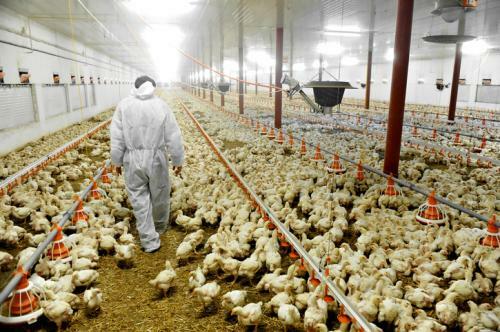 As mentioned in the study, the poultry industry in the country uses antibiotics for purposes other than disease treatment and there are no stringent policies in place to curtail such use. Centre for Science and Environment studies in 2014 and 2016 on chicken and aquaculture in West Bengal respectively highlight the unrestricted availability of antibiotics for use in both the sectors. A circular was issued by the Department of Animal Husbandry, Dairying and Fisheries (DADF) addressed to all state animal husbandry commissioners saying that antibiotics must not be used for growth promotion, but there has been no action after that. The poultry feed standards from the Bureau of Indian Standards also does not prohibit antibiotic use in poultry feed formulations. This is in contrast to the European Union (EU), where the use of antibiotics as growth promoters in food animal production was banned in 2006.